Get ready to experience golf like never before! For the first time in its 147-year history, golf is coming to Adelaide Oval. From Monday, 29 October – Sunday, 4 November 2018, the stadium will be transformed into a golfer’s paradise. In partnership with Australian Golf Digest, Adelaide Oval Stadium Golf will feature a nine-hole stadium golf course, a nine-hole putting course, a Clubhouse putt and longest drive simulator competition. Teeing off from locations around the stadium, including level 5 in the Riverbank Stand, the northern mound at the base of the famous Moreton Bay fig trees and a purpose-built platform in the front of the heritage scoreboard, this bespoke stadium golf course is sure to become a must-play course for every golfer in the country. Play will commence with a shotgun start each day at 7am and continue throughout the day until the final tee time of 8:30pm. Price: from $89 per person (booking fee applies) – strictly limited tickets so don’t delay! 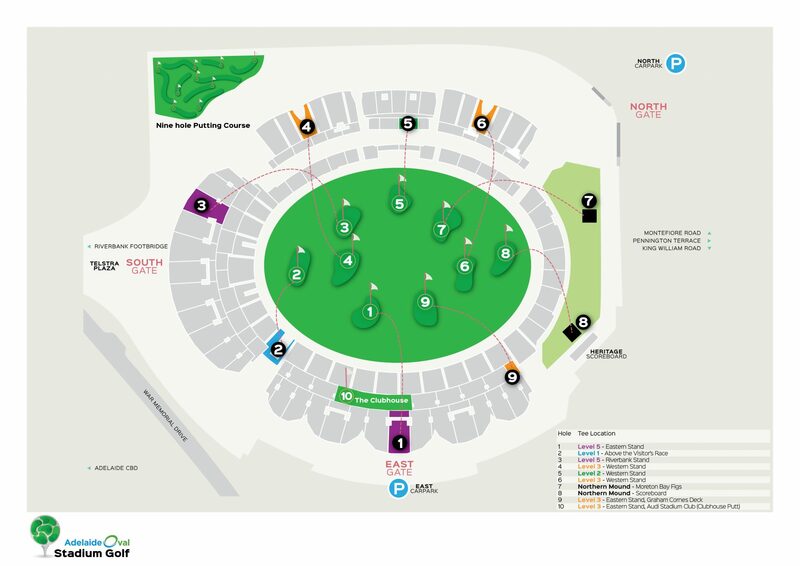 Are you ready to have a hole lot of fun at Adelaide Oval Stadium Golf? Please take time to read the following information about the event. For the comfort, safety and enjoyment of all patrons, staff and event participants, the following conditions of entry apply to all Adelaide Oval attendees. How do I get to Adelaide Oval? Adelaide Oval is located 400 metres from the CBD and just a few minutes’ walk from public transport networks (train, bus and tram). Patrons are strongly encouraged to use public transport when attending events at Adelaide Oval. The Adelaide Railway Station is located on North Terrace, approximatley a five-minute walk across the Riverbank footbridge or via King William Street. For timetables and more information visit the Adelaide Metro website. Trams operate between Glenelg and the city with stops located on North Terrace and King William Road (outside the Adelaide Festival Centre). For timetables and more information please visit the Adelaide Metro website. Bus services run throughout the Adelaide metropolitan area and service several bus stops in the vicinity of Adelaide Oval. Refer to the Adelaide Metro website for details. On major event days taxi ranks and drop-off zones are located on Pennington Terrace and King William Road. For most major events at Adelaide Oval patrons can take advantage of the Adelaide Oval Express Services across train, tram and bus routes. Travel is free upon presentation of a valid event ticket. Do you have any additional concerns? Want us to follow up with you? How do I contact Adelaide Oval? Please visit the Contact Us section of our website. What do I do if I have lost/left an item at Adelaide Oval? Please call the Stadium Concierge on 08 8205 4700 or email enquiries@adelaideoval.com.au to make a lost property enquiry. Looking to add a little more adventure to your next function? Take your event to new heights with RoofClimb – get in touch to find out more about our exciting range of group packages. Invite your guests to take an unforgettable journey behind the scenes on an Adelaide Oval Stadium Tour, exploring a number of fascinating areas that are usually inaccessible. Serving up breakfast, lunch, coffee and everything in between, Koffee Ink Café is the perfect spot for delicious meal or a relaxing drink.